The summer holidays are well under way, not surprisingly the weather has been pretty crap and we’ve been desperately trying to keep the kids entertained whilst sticking to our budget. We’re going away for a long weekend next week and I’m trying to curb our spending until then so we’re not counting the pennies! 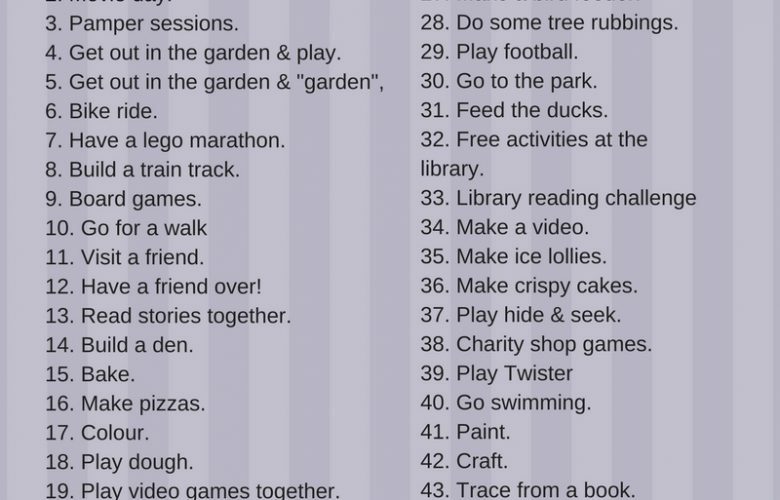 I’ve put together a list of 50 ideas for ways to keep the kids happy & entertained for not much money. I hope they’re useful! Junk modelling – always a winner in our house! Save up your “junk” for a week or so beforehand so you’ve got enough bits to keep them happy. Get out in the garden & play. Get out in the garden & “garden”, my kids LOVE helping with weeding, the loons. Go for a walk – an oldie but a goodie. Find a hill to roll down – hours of fun. Go hunting for ladybirds, butterflies or caterpillars. Look out for free activities at the library. Visit the library to get books – take part in their summer reading challenge. Try charity shops for cheap games & toys. Get a big cardboard box & make a car/space rocket/plane. Have a dressing up day.